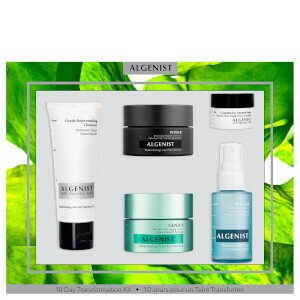 Restore healthy radiance with ALGENIST Glow and Go Kit; a trio of high-performance treats that work in synergy to promote a luminous, revitalised complexion with long-lasting hydration. Housed in a branded box. 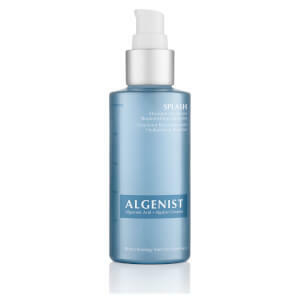 A weightless formula that provides instant refreshment for the visage. Utilising mineral-enriched Sea Water, Sea Fruit Extract and Algalyte Complex, the serum mist envelops skin in a veil of hydration, which eliminates areas of dryness, whilst encouraging a youthful complexion. A unique Polysaccharide blend offers a protective shield that seals in moisture and sets makeup to ensure long-lasting, flawless wear. Gliding effortlessly onto skin, the featherweight formula diffuses light to create a soft focus, luminous effect, whilst colour correcting and treating uneven skin tone with an AlgaCorrecting Complex. Wear alone to highlight targeted areas such as the cheekbones and down the centre of the nose, or mix with your daily beauty products for an all-over glow. Helps to reduce the appearance of fine lines and wrinkles. 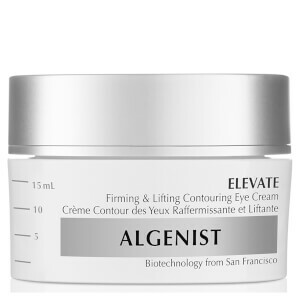 Addressing key signs of ageing and fatigue, the multi-tasking eye cream targets fine lines, wrinkles, crow's feet, dark circles and puffiness to promote a brighter, younger-looking eye contour. Synergising Alguronic Acid and Tetrapeptide-21, the non-greasy formula visibly tightens and firms, whilst a blend of Cucumber, Aloe and Green Tea work in tandem to soothe, hydrate and nourish. Mist: After makeup application or anytime hydration and refreshment are needed, spray in a Z formation - hold bottle 6-8 inches from face, close eyes, and spray across the forehead, then spray across the face diagonally followed by a spray across the lower face. Reapply as desired. Drops: Shake well. Apply directly to the bridge of the nose, cheek and brow bone and blend under or over makeup for instant radiance. Can be used alone for an enhanced highlighting effect, or added to your favourite beauty products to impart a luminous glow. Balm: With your ring finger, apply by patting gently into the skin beginning with the outer contours of the eyes, along crow’s feet and fragile skin under the eye area, working up to the brow bone. Allow to absorb for 1 minute before applying eye makeup. Use morning and evening for optimal results. Mist: Water (Aqua, Eau), Pentylene Glycol, Parachlorella Beijerinckii Exopolysaccharides, Codium Fragile Extract, Coccoloba Uvifera Fruit Extract, Porphyridium Cruentum Extract, Nannochloropsis Oculata Extract, Enteromorpha Compressa Extract, Pullulan, Sea Water (Maris Aqua), Citrullus Lanatus (Watermelon) Fruit Extract, PEG-40 Hydrogenated Castor Oil, Lens Esculenta (Lentil) Fruit Extract, Pyrus Malus (Apple) Fruit Extract, Magnesium Aspartate, Zinc Gluconate, Copper Gluconate, Adenosine, Sodium Lactate, Biosaccharide Gum-4, Butylene Glycol, Sodium PCA, Glycerin, Propanediol, Ethylhexylglycerin, Hexylene Glycol, Caprylyl Glycol, Potassium Sorbate, Sodium Benzoate, Chlorphenesin, Phenoxyethanol, Fragrance (Parfum). Drops: Water (Aqua, Eau), Dimethicone, Mica, PEG-10 Dimethicone, Nylon-12, Glycerin, Isododecane, Ethylene Brassylate, Cetyl PEG/PPG-10/1 Dimethicone, Chlorella Protothecoides Oil, Parachlorella Beijerinckii Exopolysaccharides, Chondrus Crispus Extract, Haematococcus Pluvialis Extract, Dunaliella Salina Extract, Aphanizomenon Flos-Aquae Extract, Halidrys Siliquosa Extract, Diamond Powder, Pongamia Glabra Seed Oil, Hydrogenated Starch Hydrolysate, Citric Acid, Propylene Carbonate, Ethylhexylglycerin, Polymethylsilsesquioxane, Sodium Dehydroacetate, Polysilicone-11, Triethoxycaprylylsilane, Disteardimonium Hectorite, Dimethiconol, Sodium Chloride, Magnesium Sulfate, Benzoic Acid, Dehydroacetic Acid, Potassium Sorbate, Sodium Benzoate, Phenoxyethanol, Iron Oxides (CI 77491), Titanium Dioxide (CI 77891). Balm: Water/Eau (Aqua), Stearic Acid, Isopropyl Isostearate, Glycerin, Dimethicone, Pentylene Glycol, Glyceryl Stearate SE, Dimethicone Crosspolymer, Butyrospermum Parkii (Shea) Butter, Cetearyl Alcohol, Undaria Pinnatifida Extract, Limnanthes Alba (Meadowfoam) Seed Oil, Algae Exopolysacharides, Alaria Esculenta Extract, Bambusa Vulgaris (Bamboo) Leaf/Stem Extract, Aloe Barbadensis Leaf Juice, Aloe Barbadensis Leaf Juice Powder, Camellia Sinensis (Green Tea) Leaf Extract, Cucumis Sativus (Cucumber) Fruit Extract, Tocopheryl Acetate, Caffeine, Tetrapeptide-21, Dipeptide-2, Palmitoyl Tetrapeptide-7, Palmitoyl Oligopeptide, Magnesium Ascorbyl Phosphate, Malus Domestica Fruit (Apple) Cell Culture Extract, Rubus Idaeus (Raspberry) Leaf Extract, Glucosamine HCL, Pisum Sativum (Pea) Extract, Inula Crithmoide Extract, Phospholipids, N-Hydroxysuccinimide, Chrysin, Hesperidin Methyl Chalcone, Lecithin, Caprylic/Capric Triglyceride, Vinyl Dimethicone/Methicone Silsesquioxane Crosspolymer, Acrylates/C10-30 Alkyl Acrylate Crosspolymer, Steareth-20, Ceteareth-20, Butylene Glycol, Xanthan Gum, Disodium EDTA, Aminomethyl Propanol, Potassium Sorbate, Chlorhexidine Digluconate, Caprylyl Glycol, Hexylene Glycol, Ethylhexylglycerin, Phenoxyethanol.